“What’s the password? Bananas? !” This show is certainly that! This week, The Comedy About a Bank Robbery is in town bringing side-splitting laughter with it. Brought to you by Mischief Theatre, the same group that gave us The Play That Goes Wrong which was a phenomenal sell-out success. This is one of the funniest shows we’ve seen at the theatre –The Play was fab, however I definitely did more belly-laughing with this one!! A huge hit with the audience with laughs and applause throughout. Plenty of innuendos, constant wordplay with puns, wit and banter. 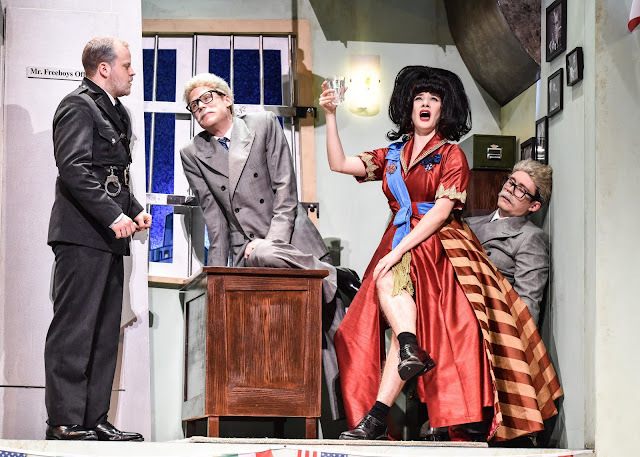 Us Brits do love a comedy that doesn’t take itself too seriously and we sure thrive on making a mockery of others on stage and pushing boundaries…men, women, thieves, bank managers, moustaches, old people, lovers, police, seagulls – you name it, they ridiculed them! The story follows Mitch who has escaped from prison to rob the rare diamond under lock and key at Minneapolis City Bank. He is joined by a band of fellow robbers including Caprice Freeboys, daughter of the bank’s manager and a successful swindler of all the local men. Neil Cooper, one of the prison guards and Sam Monaghan, son of the bank’s clerk and petty thief. Of course, they encounter endless obstacles and calamities along the way. The stage set was excellent and included a few unexpected scenes as well as clever twists and turns, sounds and lighting. The cast and ensemble were all superb and many of them are fairly fresh out of drama college! They’ve clearly trained to an excellent standard and have a real presence on stage. As I always say, the show is so much better when the cast are clearly having the time of their lives up on that stage. A clever combination of slapstick and satire not too unlike Monty Python or Fawlty Towers – very John Cleese. This show is suitable to anybody with a sense of humour. If you don’t have one, I probably wouldn’t bother. Tickets available on www.atgtickets.com and the show is on until Saturday 24th November 2018.